More details are coming in about the Parkland, Florida shooter’s mental health, and what it means in correlation to the states lax gun laws. Nikolas Cruz is charged with 17 counts of premeditated murder, after his attack on his former Parkland High school and is to be seen in court at 2pm today. The 19 year old had been removed from Marjory Stoneman Douglas, the Parkland High school and was expelled after he had shown violent tendencies and shown off his firearms to other students in the past. Classmates told about the student’s history of bringing firearms to school, bragging about killing animals and erratic behavior that scared his classmates. Attorney Jim Lewis mentioned Cruz has suffered from depression. His father had passed away from a heart attack when Nikolas was only 9, then his mother passed on November 1, 2017 after battling the flu and pneumonia. He began living with a classmates family after living with a family friend and requested to live elsewhere. From looking at his social media accounts, Broward County Sheriff Scott Israel called it a “very disturbing” picture and noted that the FBI had received at least two threat reports about Cruz, according to the official. A user going by the name of Nikolas Cruz also included slurs against blacks and Muslims in his posts. The Anti-Defamation League reported Thursday that it had spoken with Jordan Jereb, believed to the be the leader of a white supremacist group called the Republic of Florida. 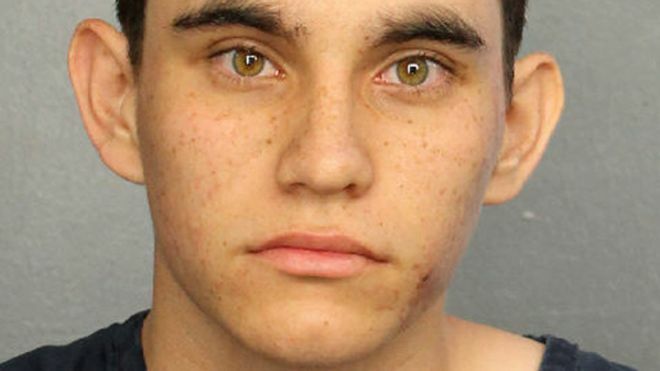 Jordan Jereb told the ADL, in a report, that Cruz “had participated in one or more ROF training exercises in the Tallahassee area, carpooling with other ROF members from south Florida.” Jereb explicitly added that the group had not ordered Cruz to commit an act like the school shooting, the report said. In September, a YouTube user going by Nikolas Cruz posted a comment to a vlogger’s YouTube page, saying, “Im going to be a professional school shooter.” A law enforcement official confirms the FBI received a report about the post, one of two threat reports the agency received about Cruz. The family he was living with have been cooperative and knew that Cruz owned the AR-15 he used in the shooting, but said they made him keep it in a locked cabinet, although he was able to keep a key for himself. “This family did what they thought was right, which was to bring in a troubled kid and try to help him out,” said the family’s Attorney Jim Lewis. The family had helped Cruz get into a GED class and get a job at local Dollar Tree, Lewis told. Governor Rick Scott went to Parkland on Wednesday night to mourn with the families of the victims. The Governor told reporters that he would meet with lawmakers in Tallahassee to find ways to keep people with mental illness from obtaining weapons. “If someone is mentally ill, they should not have access to a gun,” he said. “It is not enough to simply take actions that make us feel like we are making a difference; we must actually make that difference,” Trump said.